Lonville at Aston Martin Works, Newport Pagnell - What is happening in the world of Lonville? Aston Martin Works in Newport Pagnell hosted 40 Lonville owners and friends for a magical tour and apero at this historic site. Lonville’s intimate relationship with the world of classic cars is not a secret. So we were rather stirred (not shaken) when Aston Martin, one of the world’s most iconic automotive brands, announced it was going to build 25 continuations of the spectacular 1959 DB4 G.T. Just as exciting was the fact that these 25 DB4 G.T. are going to be build at the historic site of Aston Martin in Newport Pagnell. Lonville’s dedication to craftsmanship, exceptional finish and a true passion for the product is a close fit with philosophy of the craftsmen at the Aston Martin Works. Moreover, the fact that just 25 continuation Aston Martin DB4 G.T. will be constructed fits perfectly with Lonville’s dedication to small and unique series of watches. 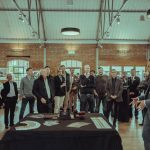 A special thanks goes to Aston Martin’s Paul Spires (Director of Aston Martin Works) who welcomed our guest and, together with Simon Bench, showed the Lonville participants the different stages of restoration and creation. A whole raft of unique historic cars were on display at different stages of restoration. And each time when Paul politely asked us to “please don’t take pictures of this next car” it was a sure cue for a one-off client car, a Zagato prototype, a registration plate connected to royalty or simply “something we are working on”. No wonder numerous Aston Martin clients ship cars back to this historic site for Service and maintenance. A demonstration of the english wheel (literally two wheels that help to form aluminium body parts for classic car restoration, but also for the DB4 G.T. continuations) showed the unique skills that are well preserved in Newport Pagnell. Just as exciting is the trimming shop that creates some of the finest interiors in the industry as well as rather unique customer request for accessories. A truly memorable experience, and the site has evolved immensly from Lonville’s Joost Vreeswijk visit some 20 years earlier. All in all, this was an amazing experience and a reminder of the real heart and soul that goes into these iconic cars. During the watch presentation Lonville also surprised new Lonville owner MJH by presenting him with only the second made Virage ’59 Blue GMT. This is the blue dialed white gold, automatic micro-rotor movement Virage.